Where you can play poker? This is the question that bother most poker players, regardless of age of wealthy. 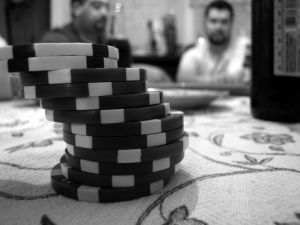 In order to have comfort poker game â€“ except adequate number of players which can be found and placed in one place at all – we must make sure that everything will be perfect. Proper poker table, professional croupier who will ensure that everything goes well and will inform about actual score (he must stay alert too, because when an error occurs he must be the one to note and correct it). Of course we also have to have appropriate amount of time, cash and desire to organize everything. But it turns out that this is not necessary because there are simpler ways to play poker. I am thinking about online poker of course, which is as good as ordinary, normal poker. In online poker, everything is still taking place with normal people of flesh and blood but they aren’t next to us but at the other side of Computer monitor. Of course â€“ just like in normal poker â€“ we must know where we can play in online poker to get most fun from play. Fortunately in internet, there are many places called poker rooms which allow us to play poker at the highest level of quality. One of the most popular is undoubtedly PartyPoker where I sincerely recommend to start our journey in online poker world. Of course, PartyPoker isn’t the only one with good opinion. Equally good poker rooms are Paradise Poker and Full Tilt Poker, but unfortunately it appears that FTP has problems with license. For fussy poker players there is also PokerStars â€“ the biggest poker room in internet. Unfortunately it’s been a long time when I last checked PokerStars so I don’t know if they got rid of this irritating bots. And remember – play only for fun! Poker fun is rule number one of good poker game.